400 GB of hard disk space, a 10Gbps download connection, 505Mbps upload connection and 2TB upload traffic. 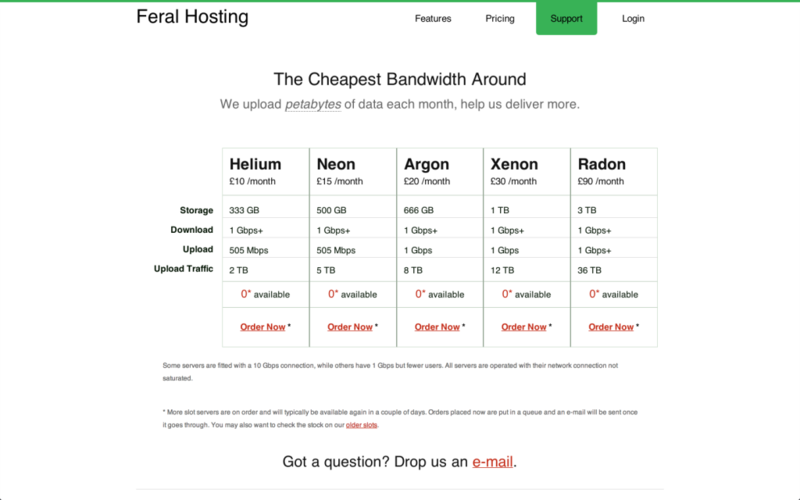 Check out all the Feral hosting plans here. 10 Gbps connection for downloading, 505 Mbps for uploading. The download speed is phenomenal, when there are plenty of seeds, the connection easily exceeds 100 MB/s and there are no complaints on this side. The upload speed is less impressive, but I’m not sure wether that’s because of the trackers being saturated with seeders or the connection. However, there is no problem with the upload because the seedbox is always on, files can just be left seeding. I’ve had to deal with the support team on a few occasions. Once was when my old seedbox plan was being upgraded to a newer plan which faster speed and more space. The support were very friendly and as I say, they were giving me extra space and speed for the same price! 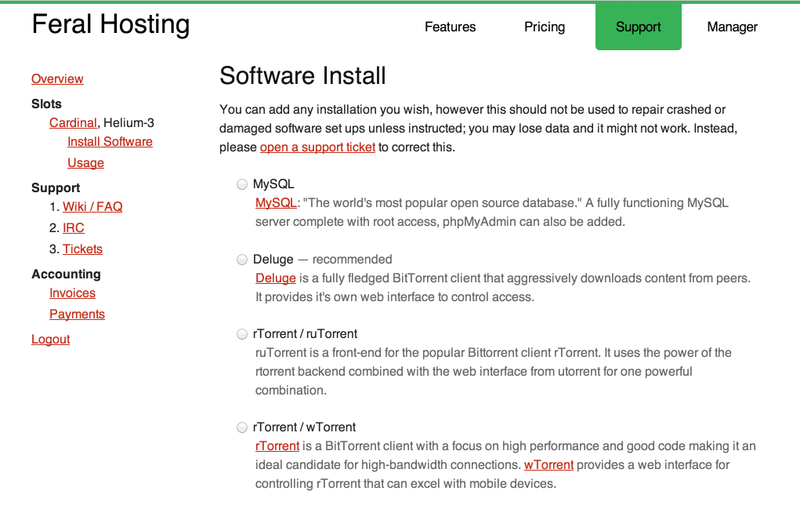 The site also features a load of documents about setting up software on your server and other torrent related things which is really helpful. The software choices for seedboxes are Deluge, rTorrent / ruTorrent, rTorrent / wTorrent or Transmission. I went for ruTorrent which I’m more than happy with. This is probably the best time to report about Ferals awesome customer back-end. It is a fully custom back-end that lets you install torrent clients, a VPN or MySQL on your box. I’ve never seen a better service from a seedbox host!